Sonia is available for Teaching Residencies in the schools through Salem Art Association, or by private arrangement for individual or group instruction. An experienced art teacher for all ages, Sonia is available for Workshops in the following areas: book arts, watercolor, printmaking, sketchbook journaling, and mixed media work. 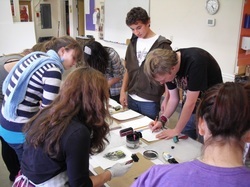 She also offers a collaborative Art-Poetry Workshop with poet Dawn Diez Willis. Private and group lessons are taught at her studio. Use the contact form to register with Sonia. REGISTRATION INFORMATION Directions to studio sent upon registration. 1. Please contact the artist with the name and grade level of school age children enrolled. Please indicate any special needs. 2. Artist will contact you with directions to studio and information specific to session(s) selected. 3. Space in class is reserved when payment is received. Please remit payment prior to the start of class. Checks payable to Sonia Allen. 4. Discount Punch Cards available by request. 5. Private instruction is available by arrangement with the artist. Please contact the artist if interested in this option. 1. Cancellations more than two weeks prior to class start will be issued a refund of charges. 2. No refunds will be issued for cancellations within two weeks of class start. 3. Artist reserves the right to cancel any class if necessary, in which case a full refund will be issued.